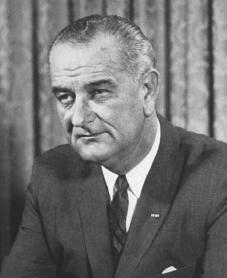 As the thirty-sixth president of the United States, Lyndon B. Johnson created new programs in health, education, human rights, and conservation. He was also aggressive in the fight against poverty, beginning what he called the "War on Poverty." Lyndon Baines Johnson was born on August 27, 1908, in Stonewall, Texas. Johnson's father, Sam Ealy Johnson, Jr., had served in the Texas legislature. After he lost a large sum of money trading cotton, he struggled to raise his two sons and three daughters. Johnson's mother was a gentle woman who encouraged her children to love books and gave them a sense of duty and responsibility. Johnson graduated from Southwest State Teachers College in San Marcos, Texas, with a bachelor's degree. While in college, he had combined his studies with a job teaching Mexican American children. In 1931 Johnson went to Washington, D.C., and worked as secretary to Texas congressman Richard Kleberg (1887–1955). Almost immediately Johnson's talent for attracting affection and respect became visible. He was elected speaker of the "Little Congress," an assembly of congressional secretaries on Capitol Hill. On November 17, 1934, he married Claudia (Lady Bird) Taylor (1912–) of Karnak, Texas. With her, Johnson found constant strength, love, and support. At age twenty-seven Johnson returned to Texas to become the state director of the National Youth Administration. In 1937 the congressman from Texas's Tenth District died suddenly. When a special election was called to select a replacement, Johnson joined a race crowded with seven other candidates. To the amazement of many long-standing politicians, the twenty-eight-year-old Johnson won the race. In 1941 he ran for a Senate seat but lost by a small margin. That December he became the first member of Congress to enter active military duty in World War II (1939–45; a war in which the Allies—France, Great Britain, the Soviet Union, China, and from 1941 the United States—fought against the Axis powers—Germany, Italy, and Japan). He joined the navy and in 1942 received the Silver Star for his contribution to a bombing mission over New Guinea. When President Franklin D. Roosevelt (1882–1945) ordered all congressmen in the military back to the capital in 1942, Johnson reentered the House. In 1948 Johnson finally won election to the Senate. The other senators soon recognized that he was not an ordinary first-term senator. He was knowledgeable about every item that was brought before the Senate. In January 1951 Johnson was named Democratic "whip" (assistant minority leader). In 1953, when the post of minority leader in the Senate opened up, Democratic senators chose Johnson to take charge. After the Democrats won a majority of seats in both houses in the congressional elections of 1954, Johnson became the youngest man ever to serve as majority leader. the Senate. Then in 1958, while representing the United States at the United Nations, he called for the peaceful exploration of outer space. He uncovered waste in defense spending and began an investigation. In 1960 Johnson briefly ran against John F. Kennedy (1917–1963) for the Democratic presidential nomination. Kennedy later chose Johnson as his vice presidential running mate. While some Kennedy supporters complained, experts later agreed that Johnson's tireless campaigning in Texas and the South led Kennedy to victory in the 1960 election. Johnson had many important assignments as vice president. One of his tasks was to improve the growing U.S. space program, which had been overshadowed by explorations and new discoveries that had been made by the Soviet Union. Regarding civil rights, as chairman of the President's Committee on Equal Employment Opportunity forces, he surprised many critics by putting constant pressure on American businesses. The committee had been created by President Kennedy in 1961 to enforce an executive order prohibiting discrimination (unequal treatment) based on race in government employment. Then on November 22, 1963, President Kennedy was assassinated in Dallas, Texas. The next day, aboard the plane Air Force One at Love Field in Dallas, Johnson took the presidential oath of office. Giving orders to take off seconds later, the new president flew back to Washington to take command of the government while the nation grieved for its fallen leader. Five days after taking office, President Johnson appeared before a joint session of Congress. Speaking firmly, he pledged, "We shall continue." The new president, meeting around the clock with staff, cabinet members, and congressmen, helped pass important legislation that had been put before Congress by President Kennedy but had been held up in various committees of both houses. Johnson especially pushed the passage of a civil rights bill that was much stronger than any that had come before, which had been of great importance to Kennedy. On July 2, 1964, Johnson signed the Civil Rights Act, which prohibits discrimination (unequal treatment based on race) and segregation (separation based on race) in public places, employment, and voting, into law. Six months after becoming president, Johnson announced his plan called the "Great Society." The areas he emphasized were health and education; urban problems such as pollution, housing, and transportation; civil rights; and preservation of natural resources. Johnson took his programs to the nation during his campaign for the 1964 election. Meanwhile, American involvement in the Vietnam War (1955–75; a war in Vietnam in which South Vietnam was fighting against a takeover by Communist North Vietnam) became an issue. Johnson's opponent, Senator Barry Goldwater (1909–1998), spoke against Johnson's approach to domestic problems and also suggested that the use of force against North Vietnam should be increased. Johnson traveled the nation and convinced voters that they could not afford to drive him from office. He won by the widest margin in any presidential election in American history. After his huge victory President Johnson began a massive legislative program. Between 1965 and 1968 more than 207 bills were passed by Congress. During Johnson's presidency education and health spending were increased. Within three years of the passage of the Voting Rights Act in 1965, which made discrimination in voting illegal, nearly one million African Americans registered to vote in the South. Most importantly, the Johnson presidency was the strongest era of national prosperity (economic success), marked by more than eighty-five months of economic growth. The wages of factory workers increased, millions of workers were brought under minimum-wage protection, total employment increased, and the unemployment rate (the number of people who are unemployed) dropped to its lowest point in more than a decade. The president also made important gains in foreign affairs. U.S. involvement in Cyprus and the Congo prevented the outbreak of wars in those countries. In the Dominican Republic, the threat of a Communist takeover was ended by an overwhelming show of force by the United States and Latin American countries. As a result, a democratic government and free elections were put back into place in the Dominican Republic, and U.S. troops left the country soon after. Talks on an outer space treaty with the Soviet Union were held, and in June 1967 the president met with Soviet leader Alexei Kosygin (1904–1980). Johnson devoted the bulk of his time and effort to dealing with the Vietnam War. All three presidents that served before Johnson had declared that the security of the United States was involved in protecting South Vietnam from a communist takeover by North Vietnam. However, there was much disagreement in the United States over the way this problem should be solved. Some critics claimed the situation in Vietnam was a civil war, not an invasion, and they opposed U.S. involvement. In 1965 the United States increased its military support of South Vietnam and sent over more American troops. By 1968 many people who were against U.S. involvement in the war were calling on the Johnson administration to remove U.S. troops from Vietnam. Bothered by increasing criticism, yet determined to end the war and begin serious peace talks, President Johnson startled the nation and the world on March 31, 1968, by stating that he would not run for election to another term as president. Johnson said that it was so important to resolve the Vietnam situation peacefully that even his own political future should not stand in the way of this goal. He said that he would not seek reelection so he could spend the rest of his days in office working on a settlement. On May 11, 1968, it was announced that peace talks would begin in Paris, France. Then in November 1968 the president declared that all bombing of North Vietnam would end. At the end of Johnson's presidency, he retired to his ranch near San Antonio, Texas, where he became interested in the care and sale of his cattle. On January 22, 1973, Johnson suffered a heart attack while lying down to take a nap, and he died later that afternoon. Lyndon Johnson was one of America's most experienced and politically skilled presidents. He tried to improve the quality of life for people living in the United States and to help new and small nations develop their own forms of government without fear of invasion from their more powerful neighbors. Califano, Joseph A., Jr. The Triumph and Tragedy of Lyndon Johnson. New York: Simon & Schuster, 1991. Reprint, College Station: Texas A&M University Press, 2000. Eskow, Dennis. Lyndon Baines Johnson. New York: Franklin Watts, 1993. Johnson, Lyndon Baines. The Vantage Point: Perspectives of the Presidency, 1963–1969. New York: Holt, Rinehart, 1971. Kaye, Tony. Lyndon B. Johnson. New York: Chelsea House, 1988. Unger, Irwin, and Debi Unger. LBJ: A Life. New York: Wiley, 1999.